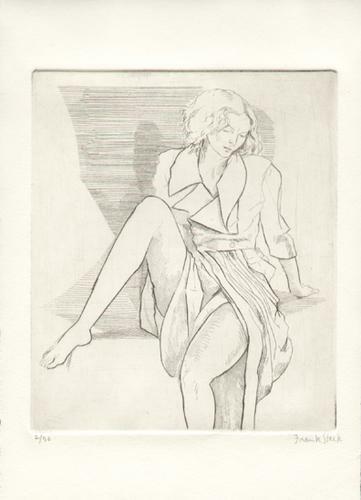 This original hand-printed and pencil signed etching represents a female figure wearing a dress with wide lapels, The artist models the form using a series of hatched and cross hatched lines. Using the process of stage-biting, he varies the thickness of the lines so that dark lines outline the contours of the form, and delicate lines represent the shadows. This impression comes from a limited edition of 50 prints. Image size: 7" 5.9." Sheet size: 11.8" x 7."